Global chocolate companies have been told they have a moral responsibility to do more to stop children working on cocoa farms in West Africa. A recent report commissioned by the US government found that more than 1.8 million children in West Africa were involved in growing cocoa. Many were at risk of being injured by machetes, pesticides or through other hazards. The Ivory Coast exports nearly half the world's cocoa. After years of civil war, the new government says ending poverty and child labour is a priority and the chocolate industry must be involved. "There is a moral obligation," said Gilbert Kone Kafana, minister for labour and social affairs. "The chocolate companies have a duty to engage with us. We need to build roads, schools, hospitals and social centres; anything that would allow Ivory Coast to progress. "This development is necessary for farmers to have a good life, and it is in the interest of the industry to work with us." The chocolate industry is worth more than $90bn (£56.5bn) a year, and more than 40% of people in the Ivory Coast live below the poverty line. Ten years ago, under international pressure, chocolate companies signed an international protocol to stop the practice of dangerous child labour. They promised to "commit significant resources" and act "as a matter of urgency." But the report by Tulane University in the US, found that the chocolate industry's funding since 2001 had "not been sufficient" and it needed to do more. 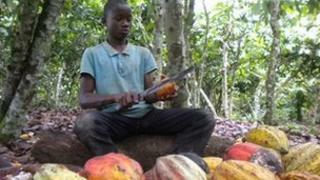 The sight of children carrying machetes or pesticide equipment is common throughout Ivory Coast's cocoa belt. More than 800,000 children here are believed to do some form of cocoa-related work. I found a group walking along a muddy path towards trees where bright yellow cocoa pods hung ready for harvest. Silently, the children squatted down and started work. They wore torn and grubby shorts and T-shirts. There was no laughter or play. On their legs were scars from machete injuries. There was no first aid kit around or any protective clothing. In one hand they held a cocoa pod. With the other they hacked it open with a machete, then prized out the beans. Under the present system, once sold to market, it is impossible to trace exactly where the beans came from - and whether or not young children are being forced to work to produce them. One of the children was Kuadio Kouako who said he was 12 and whose home was more than 320km (200 miles) away. At first, the farm's owner insisted that three of the boys were his sons and that two belonged to a friend. But when I asked for their names, he hesitated - then left. "I was living in Bouake with my grandmother," Yao Kouassi said. "But my father sent me here to work. I haven't seen my family for three years." Yao's story is depressingly familiar among children trafficked or sent away from their families and kept out of school and working for no money. The chocolate industry has sponsored some projects such as in the village of Campement Paul, near the city of San Pedro. In 2008 a small school was built, for which the villagers had to pay half of the $20,000 (£12,570) costs. It can accommodate about 150 children. But the villagers say that another 400 in the community still have no school to go to. One child who has benefited is Dera, now 15. When the school opened, his father took him off cocoa work so he could learn to read and write. "You get very tired when you work so much," he said, showing scars he still has from his machete injuries. "Every day I would wake at six o'clock and go straight to the cocoa farm." The chocolate industry concedes that more needs to be done, but says that even since 2009 its programmes have helped hundreds of thousands of cocoa farming families and more than one million children. Company executives refuse to speak on this issue and refer queries to public relations consultant Joanna Scott. "Far too many children are in the worst forms of child labour and that is unacceptable to us," she says. "No child should ever be harmed in the growing and harvesting of cocoa and that is why we are totally committed to work with others in resolving the situation." Last year, under continuing pressure, the chocolate industry signed another agreement - this time to cut by 70% the number of children working in dangerous conditions by 2020. There is, though, some difference over the figures. The US study found that between 2001 and 2009, less than 4% of people in Ivory Coast's cocoa-growing communities had been helped by the industry's programmes, and about 33,000 children. The chocolate companies say they have done much more. But the US Department of Labor, a signatory to the new agreement, backs the Tulane report, saying its figures are "credible and reliable". If that is the case, even if the 2020 target is achieved, almost a quarter of a million children would still be at risk, harvesting cocoa for global chocolate companies.